Howdy pard’ner! You might think us cowboys to be serious folk, but after a hard day’s work there ain’t nothin’ better than relaxin’ by the fire with a sarsaparilla and havin’ a good laugh. And believe me when I tell you a cowboy could tell you a million stories that would have you splitting your sides. I took some time to scribble some of them jokes down for y’all, and I hope you enjoy them. Some of ’em are even true! What’s the nearest thing to silver? The Lone Ranger’s bum. Why did the cowboy sleep with his saddle on? In case he caught any nightMARES! Willie has worked on farms and ranches for as long as he can remember. 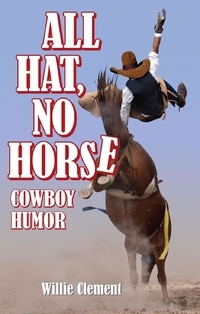 He has broken horses, driven cattle and at once he was even lassoed to be the cook. They say that the cook is the most important member of the crew on a cattle drive? Well, maybe not that time… Willie now has his own ranch and wouldn’t have it any other way. Some of his favorite memories come from jawin’ around the campfire.